In a very competitive meet, the Camas County Mushers from Fairfield maintained their supremacy in the Northside Conference Championship track and field meet on a sunny, cool Wednesday at the Derrick Parke Memorial Field oval in Carey. Piling up 97 of their 179.5 points in the field events, the Camas girls led by senior Stephanie Moore won their seventh consecutive Northside Conference title by a mere seven points over the host Carey girls (172.5). 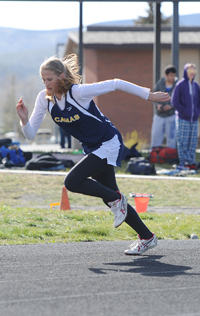 Camas and Carey girls accounted for 13 of the 17 gold medals at the nine-school meet. Top individual girls’ point-getter Moore (35.5 points) won the 100-meter high hurdles, long jump and triple jump as her junior teammate Taylor Gorringe captured the shotput and discus. Carey’s girls out-paced Camas 8-5 in the gold medal count led by the 800m/1600m/3200m distance sweep of senior Jaide Parke. Carey’s other golds: Senior McKayla Mecham in the 200m dash and freshman Medin Cenarrusa in the 300m intermediate hurdles, to go with 4x100m, 4x200m and medley relays. In addition, Community School sophomore Sydney Hagenbuch captured the 400m dash by nearly four seconds. The boys’ team race was incredibly close with the Camas boys (50 field points) earning their third Northside crown in four years by the slimmest of margins—105 to 104.5 over the Castleford Wolves (29.5 sprint points). Senior Jordan Robles (discus) and sophomore Isaac Simon (high jump) were the Camas gold medalists. Carey’s boys won the 4x100m and 4x200m relays along with senior Francisco Gamino’s shotput gold to place third with 95 points. Dietrich wound up with four gold medals—senior Logan Porter winning the 400m dash and junior Jacob Dalton the 1600m run to go with 4x400m and sprint medley wins—giving the Blue Devils fourth place with 87 points. Otherwise, the top boys’ prizes were spread around. Lighthouse Christian senior Eli Berndt was the top individual point-getter with 38 points based on golds in long and triple jumps, and the 200m dash, plus second place in the 100m dash. Castleford senior Logan Rector swept the hurdles races, and Murtaugh senior Troy Baynes won the 800m and 3200m to go along with his second place in the 1600m. Next up: The state-qualifying 4th District 1A meet Friday and Saturday, May 10-11 at Jerome High School. Teams: 1—Camas County 179.5 points (19.5 sprints, 19 distances, 18 hurdles, 26 relays, 97 field). 2—Carey 172.5 points (30.5 sprints, 35 distances, 34 hurdles, 38 relays, 35 field). 3—Richfield 72. 4—Lighthouse Christian Academy of Twin Falls 45. 5—Castleford 40. 6—Murtaugh 39. 7—Dietrich 33. 8—North Valley Academy of Gooding 20. 9—Community School of Sun Valley 16. 100m: 1—Jade Williams (Richfield) 13.80. 3—Etta Seaman (CC) 13.91. 6—Felicity Willis (CC) 14.20. 7—Kelsey Barker (C) 14.30. 200m: 1—McKayla Mecham (C) 28.70. 3 (tie)—Stephanie Moore (CC) 29.00 and Kelsey Barker (C) 29.00. 5—Sydney Hagenbuch (CS) 29.40. 400m: 1—Sydney Hagenbuch (CS) 1:03.70. 2—Lilly Rivera (C) 1:07.50. 4—Medin Cenarrusa (C) 1:08.70. 6—Kylie Walker (CC) 1:12.10. 7—Sierra Sabin (CC) 1:13.60. 8—Annika Landis (CS) 1:14.50. 800m: 1—Jaide Parke (C) 2:38.00. 4—Kylie Walker (CC) 2:54.50. 6—Lilly Rivera (C) 2:54.80. 1600m: 1—Jaide Parke (C) 5:56.90. 4—Brittani Hulme (CC) 6:50.60. 8—Annika Landis (CS) 7:04.00. 3200m: 1—Jaide Parke (C) 12:28.40. 3—Brittani Hulme (CC) 14:47.70. 6—Adriane McGuire (CC) 16:06.40. 7—Emily Wittemann (C) 17:45.00. 100m high hurdles: 1—Stephanie Moore (CC) 18.30. 2—Medin Cenarrusa (C) 19.30. 4—Jaide Parke (C) 19.90. 6—Emily Wittemann (C) 23.20. 300m intermediate hurdles: 1—Medin Cenarrusa (C) 53.80. 3—Brittani Hulme (CC) 55.20. 4—Hailee Johnson (C) 56.40. 6—Clarissa Kirkland (C) 58.70. 7—Taylor Gorringe (CC) 1:10.30. 4x100m relay: 1—Carey (Daphne Kirkland, McKayla Mecham, Arriana Nielson, Kelsey Barker) 55.10. 2—Camas County (Etta Seaman, Tana Sabin, Felicity Willis, Isabelle Ornelas) 58.50. 4x200m relay: 1—Carey (Lilly Rivera, Kelsey Barker, Arriana Nielson, McKayla Mecham) 1:56.10. 2—Camas County (Etta Seaman, Tana Sabin, Felicity Willis, Taylor Gorringe) 2:04.70. 4x400m relay: 1—Lighthouse Christian (Jackie vanVliet, Nicole Van Esch, Grace Kelley, Dana DeKruyf) 4:53.60. 2—Carey (Hailee Johnson, Shayla Adamson, Emily Wittemann, Natalie Villanueva) 4:56.80. 3—Camas County (Felicity Willis, Brittney Williams, Isabelle Ornelas, Sierra Sabin) 5:14.90. Sprint medley relay (100, 100, 200, 400): 1—Carey (Daphne Kirkland, Clarissa Kirkland, Arriana Nielson, Hailee Johnson) 2:08.30. 5—Camas County (Sierra Sabin, Tana Sabin, Isabelle Ornelas, Adriane McGuire) 2:15.10. Shotput: 1—Taylor Gorringe (CC) 30-8.25. 2—Jessica Lanier (CC) 29-6.75. 3—McKayla Mecham (C) 28-8.75. 6—Sierra Sabin (CC) 27-11.25. 7—Natalie Villanueva (C) 26-9.25. Discus: 1—Taylor Gorringe (CC) 101-8. 2—Jessica Lanier (CC) 92-2. 4—Etta Seaman (CC) 81-9. 6—Natalie Villanueva (C) 73-10. 7—Brittney Williams (CC) 73-7. High jump: 1—Machaela Brauburger (Richfield) 4-6. 2—Brittany Hulme (CC) 4-6.5 (tie)—Hunter Rasmussen (CC) 4-2, Shayla Adamson (C) 4-2 and Adriane McGuire (CC) 4-2. 8—Daphne Kirkland (C) 4-0. Long jump: 1—Stephanie Moore (CC) 15-4.5. 2—Hailee Johnson (C) 14-0.5. 4—Medin Cenarrusa (C) 13-3. 5—Clarissa Kirkland (C) 13-2. 6—Hunter Rasmussen (CC) 13-1. 7—Kylie Walker (CC) 12-5.5. Triple jump: 1—Stephanie Moore (CC) 31-10. 2—Hunter Rasmussen (CC) 29-6. 5—Kylie Walker (CC) 28-1. 6—Clarissa Kirkland (C) 26-11. Teams: 1—Camas County 105 points (14 sprints, 20 distances, 2 hurdles, 19 relays, 50 field). 2—Castleford 104.5 (28.5 sprints, 0 distances, 20 hurdles, 18 relays, 37 field). 3—Carey 95 (13 sprints, 9 distances, 7 hurdles, 32 relays, 34 field). 4—Dietrich 87. 5—Lighthouse Christian 80. 6—Murtaugh 75. 7—North Valley Academy 49. 8—Richfield 26.5. 9—Bliss 7. 100m: 4—Christian Zarate (C) 12.30. 6—Ebie Myles (CC) 12.60. 200m: 5—Jordan Dilworth (C) 25.90. 6—Ebie Myles (CC) 26.10. 400m: 2—Davey Knowlton (CC) 55.70. 5—Gunner Thompson (C) 59.40. 800m: 3—Davey Knowlton (CC) 2:13.20. 6—Zach Olsen (C) 2:24.80. 7—Collin Whitby (C) 2:27.90. 1600m: 3—Jerry Gonzalez (CC) 5:35.10. 5—Collin Whitby (C) 5:36.10. 3200m: 2—Jerry Gonzalez (CC) 11:34.30. 110m high hurdles: 5—Nate Adamson (C) 20.70. 7—Jordan Moore (CC) 21.30. 300m intermediate hurdles: 6—Nate Adamson (C) 48.80. 4x100m relay: 1—Carey (Christian Zarate, Luis Garcia, Gunner Thompson, Tori Alvarez) 48.10. 2—Camas County (Colton Rasmussen, Isaac Simon, Shawn Allbritton, Ebie Myles) 50.40. 4x200m relay: 1—Carey (Christian Zarate, Gunner Thompson, Luis Garcia, Tori Alvarez) 1:39.90. 3—Camas County (Colton Rasmussen, Jordan Robles, Ebie Myles, Davey Knowlton) 1:41.10. 4x400m relay: 3—Carey (Zach Olsen, Christian Zarate, Gunner Thompson, Tori Alvarez) 3:58.40. 4—Camas County (Isaac Simon, Trent Rock, Erick Peterson, Chris Eaton) 4:25.00. Sprint medley relay: 3—Carey (Nate Adamson, Jordan Dilworth, Tori Alvarez, Zach Olsen) 4:09.70. Shotput: 1—Francisco Gamino (C) 44-0. 3—Jordan Robles (CC) 42-7. Discus: 1—Jordan Robles (CC) 144-9. 5—Matt Whitworth (C) 116-2. 6—Francisco Gamino (C) 113-3. High jump: 1—Isaac Simon (CC) 5-1. 3—Bryson Van Every (C) 5-4. Long jump: 3—Davey Knowlton (CC) 18-0.75.5—Luis Garcia (C) 18-0. 6—Bryson Van Every (C) 17-10. 7—Zach Olsen (C) 17-6. 8—Jordan Moore (CC) 16-8.5. Triple jump: 2—Isaac Simon (CC) 37-7.5. 3—Colton Rasmussen (CC) 37-7. 6—Jordan Moore (CC) 36-11. 7—Luis Garcia (C) 35-11.